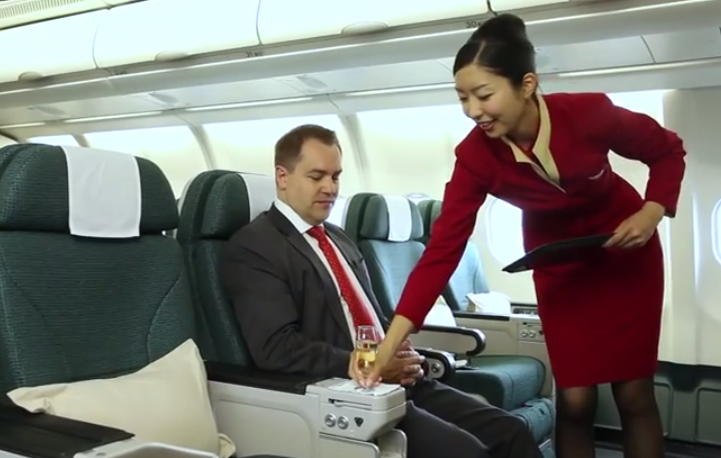 Interestingly, while searching YouTube for Premium Economy Class by other airlines, I came across one airline that showed the stewardess serving the champagne to its "passenger". Did the stewardess present the champagne correctly? If the answer is no then where has she gone wrong and which is the correct method? Your comment please. The clip is for media release to market a product. Its not for assessing, appraising the SOP for flight attendants on how they should present items to pax. Whole life with management brain on a fault finding mission. Your video clips also can comment? First & third Anonymous both are right. To second Anonymous: To market a product, it is even more imperative for the cabin crew to display finesse. As for your comment about my grooming (video clip) people want to listen to what I can offer (tips for cc wannabes) and not look at my appearance. Also one does not need to have management brain to spot something that is amiss. But this is not real life. It is a staged photograph for publicity! If she had been serving the glass with the other hand she would have been closed off to the viewers of the advertising photo. The photographer is trying to make the scene appealing to potential customers not the model in the seat. Not everything needs to be looked at with a critical eye! Yup I agree too! how can she make eye contact with the passenger when he isnt looking at the stewardess in the first place??? And to make eye contact with the passenger while placing the glass on the designated spot, its a bit challenging no? She should face the passenger and used her left hand to present the glass of champagne. The photographer would then have to be on the other side closer to the window. In this photo she is seen to be "elbowing" the passenger which is considered rude by any service standard. Layman you hit the nail on the head. That's precisely what I was thinking too. The others do not have an inkling what sterling service is all about.